key locations, is the ideal location for the golfer, business traveler and vacationer alike. Relax and unwind while watching the incoming and departing cruise ships and enjoy the breath taking view of the north westerlycoastline of Antigua from your balcony. The perfect place to enjoy a drink and relax island style. All apartments are fully air conditioned and fitted to the highest standard. Our 2 bedroom, 2 1/2 bathroom units are approximately 1,500sq ft, whilst the 1 bedroom, 1 1/2 bathrooms are approximately 980 sq ft. Kitchens have granite counter tops and are fitted with refrigerator/freezer, stove, dishwasher and microwave (most units stainless steel). 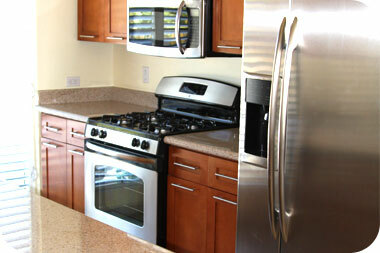 Each unit has a utility room equipped with a stacked washer/dryer, iron, and ironing board. Bedrooms contain queen size beds which have the ability to change to 2 twin beds, if preferred. 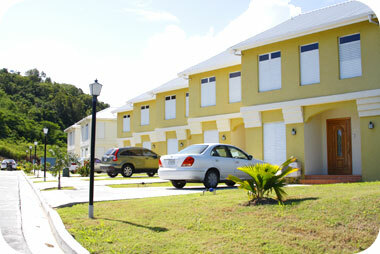 All units include cable television and high speed internet access. All bathrooms and powder rooms are tastefully decorated, each bathroom is outfitted with a walk in shower and granite surfaced vanity. Our 2 bedroom master suites also contain a jacuzzi hot tub.